I am trying to run dotCover against an IIS application. The IIS application is running a c# 4.0 WCF service. I have a set of acceptance tests which run against IIS. I want to see how much code these tests cover. I have the full version and latest (2.2.515.8) running in Visual Studio 2010 on windows 7 64 bit. The start up application window opens (IIS Application) and the correct url is set in the browser text box and the open browser checkbox is selected. Nothing happens. If I do an iisreset, nothing happens. The process drop down is greyed out and empty. 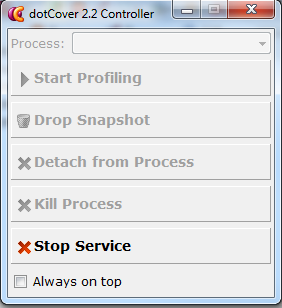 If I close the dotCover Controller window, the message: Cover Analysis finished but no shapshot created box appears. I get no report and I dont believe any analysis has taken place or in fact dotCover is attached to the IIS process at all. This was fixed magically by itself by doing the incredible technical solution of rebooting my machine. Seems to work now. Terribly sorry for the late reply. I'm glad that it works fine for you now.